Wining and Dining that’s easy on the wallet at your local Asian Bistro….PF Chang’s! Now that Thanksgiving is over, the Holiday season is in full bloom. Here in Westchester, the Westchester Mall is the place where everyone finds themselves shopping at some point. Located in the mall is a chain that most people are familiar with, PF Chang’s. While you may have eaten there before, they have a couple new value deals on the menu that are fully worth checking out. I did the other night with my wife and some friends and it was a really fun dining experience that still left us with a few bucks in our wallets. Taking our current state of the economy into consideration, many restaurants are offering “recession deals”. Some places offer weeknight price fix specials, others may waive their wine corkage fee on certain occasions. Chang’s has put together a full 4 course dinner for 2 people for $39.95 and it is available all the time!! This nice, little package includes 2 soups (2 choices), an appetizer (6 choices), 2 entrees (14 choices), and 2 mini deserts (8 choices). Not only do they offer a wide selection of choices from their menu, but they offer the most popular ones! That means you don’t have to give up having the Chicken Lettuce Wraps or Crab Wontons for apps to take advantage of the price fix. As far as the entrees go, with 14 selections it includes almost everything on the regular menu from the Chang’s Spicy Chicken, to Kung Pao Shrimp (or Chicken)…..even the Mongolian Beef (a personal favorite)! It’s very refreshing to see a restaurant not skimp out on selections, or portion size, when offering one of these price fix deals. Anyone who has gone to a restaurant for “Restaurant Week” in NYC knows what I mean. They may offer a $30 all inclusive meal per person, but with what they offer you either need to order a lot more food off the price fix or hit a McDonalds about 2 minutes after you leave the restaurant! Now for the really fun part…Chang’s has always offered a wide selection of wines by the glass (with very healthy pours I might add), but now they have added a $10 Wine Flight option. You can choose ANY 3 wines that they offer by the glass, in which they pour 2.5 ounces of each (also a very healthy pour) and serve them in their full size wine glasses. I know that sounds trivial but it makes a huge difference. Most restaurants that offer wine flights serve them in smaller glasses which really doesn’t really allow the wine to open and it takes away from the bouquet and aroma factors. 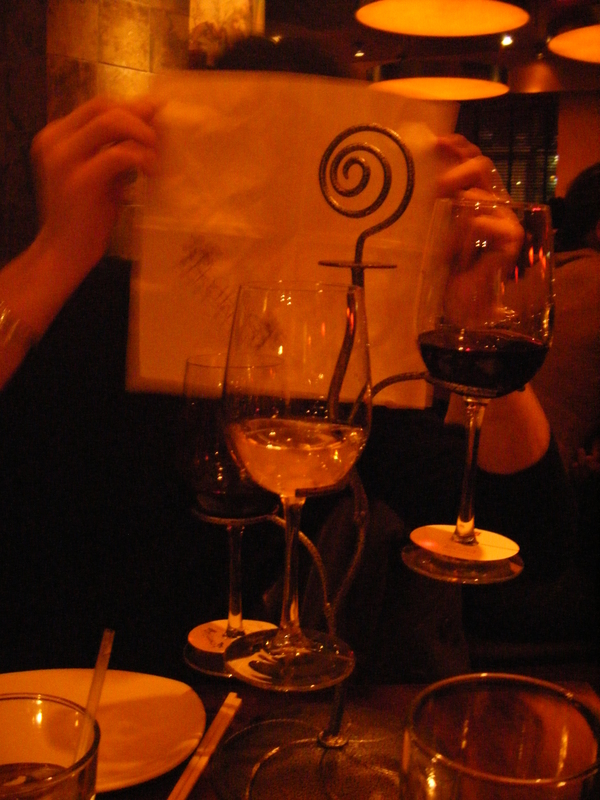 The server will also bring the glasses in this fancy wrought iron wine glass “tree” (pictured above) which is very attractive and also efficient as it doesn’t take up too much space on the table. Since the pours are fairly healthy, you can really have fun pairing the wines with the different courses. Try some of the light and crisp whites with the appetizers, like the Cloudy Bay Sauvignon Blanc or the Albarino (white wine from Spain that is quite floral, with nice hints of lemon and melon). If you are a Chardonnay fan, their selection is excellent with the Sonoma Cutrer Chardonnay being my favorite. It’s just a classic California Chardonnay with apple and pear flavors, good acidity but also has that buttery mouth feel for a very soft and smooth finish. It pairs very well with the Dumplings and the Almond and Cashew Chicken. Even though some people consider PF Chang’s to be a “Chinese food restaurant”, it’s more of an Asian Fusion style, which means there will be lots of great spices and texture to the sauces. So for the reds, the Pinots work out with some of the lighter, spicier dishes. The Wild Horse and Cambria Pinots are a couple of winners. The heavier chicken and beef dishes certainly call for selections from the bigger red wine options. The Penfolds Thomas Hyland Shiraz is a real standout, as well as the Dry Creek Cabernet. This is one of the few times where I would recommend to absolutely select the more expensive wine options for the flight. I’m all about finding the deal and value when it comes to wine prices. But the value here lies in the flight itself. So if they are going to pour any 3 wines, even though they may vary from $7 -$13 when poured by the glass, get the good stuff! This wine flight and price fix scenario has made PF Chang’s a great spot to go out with a group of friends, as it can get a bit loud in there. You can mix and match on the price fix for 2 dinners, and decide together what wines to get in the flights. It allows you to experiment with a wine that you might not want to order a whole glass of, and try different pairings that may agree with your palate. Remember, everyone’s taste buds allow them to taste things differently, so this is the time to try something you typically may not. You just may find your new favorite wine or pairing….and at these prices you can’t miss! ← What types of wines pair well with Thanksgiving dinner……LOTS!!! Can’t wait to to try it! The descriptions of the specials, food and wine pairings are great.